The Yukon River became well-known as the route that many of the gold-seekers used on their way to the Klondike Gold Rush at Dawson City, mostly covering the distance with homemade boats or rafts. After the height of the Gold Rush, paddle-wheel steamboats continued to use the river to haul goods and passengers to and from Dawson until the 1950's. And for countless years before, the area was inhabited by First Nations people hunting and fishing along the mighty waterway. Relics and stories remain from all of these eras and you recapture the spirit of those bygone times as we paddle and drift the same areas they traveled. 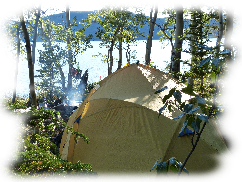 Most of our Yukon River trips begin at our wilderness home and sled dog kennel on Lake Laberge. The trips can finish at Little Salmon or Carmacks or go all the way to Dawson. While most trips are 5 to 12 days on the river, we also offer a shorter 2- 3 day trip, which begins in Whitehorse and finishes at our home/kennel at Lake Laberge and we offer longer options with more time to hike and drift or stay an extra day at a favourite camp. Most of our trips are customized private trips, so you can build the trip around your interests, available time and budget. Or ask about fitting in with other non-private groups that may be happening. 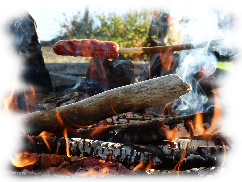 Our family began guiding on the Yukon River in the 1970's, and has accumulated a knowledge of the area over the years. This river can be enjoyed by beginners to more experienced paddlers. Trips follow the river, camping out overnight along the way. Custom made trips with a duration between 2 - 21 days. One or more days based out of our cabins for hiking with the sled dogs, having a dog team ride (on wheels), participating in other trips, or taking a rest day. 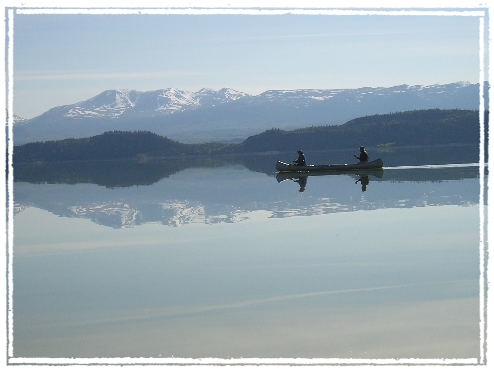 Lake Laberge to Little Salmon or Carmacks - 5 to 6 days paddling, drifting, and stopping at historic sites along the way. 7 or 8 days (or more) gives even more time for drifting or side hikes. Carmacks - Visit the excellent First Nations museum. 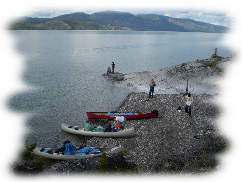 Carmacks or Minto to Dawson - 5 - 8 days paddling and drifting - Add more days for extra time drifting or spending time at the abandoned but restored village of Fort Selkirk. Dawson - Explore the town of Dawson with a guided tour of the Dawson area with trips out to "the creeks" to pan for gold and see the area that was home to the Klondike Gold Rush, which has been called the most colourful gold rush in history. We can also visit "Dredge #4" and the Midnight Dome. Highlights in Dawson include visiting Diamond Tooth Gertie's Gambling Casino with its 1898 style floor shows, or visiting historical sites such as the Palace Grand Theatre and the Commissioner's residence, plus the First Nation's museum and the Dawson museum. You may wish to have us show you around the area and then travel with us back to Whitehorse by road OR you may want to stay extra days in Dawson on your own and then fly back to Whitehorse on Air North (a very reasonably priced flight). Some guests may wish to follow the river by boat instead of canoe. This is an excellent choice for mixed family groups, folks with limited time, guests who are game to camp but aren't sure if they could paddle the whole way, OR anyone who appreciates the comfort of being inside a covered boat if the weather is bad. (The boat can also be open on the sides for hot days.) 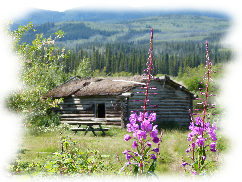 Please check out our 3-day trip to Carmacks or the 7-day trip to Dawson City.